It's Monday and it's time to meet a new Genius! Somehow she manages to keep to her style but still using fun trendy themes and I think she rocks at it. She's also so super sweet. It seems like kindness is a rarity in this world anymore with the exception of the craft industry. Kristie is one of the kind ones for sure! Time to spend some one on one time with her . 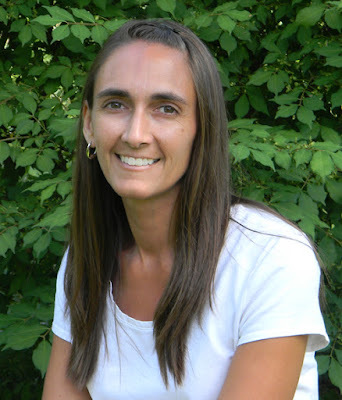 . .
My name is Kristie Goulet. I am wife to Todd and mom to Noah, Hannah, Leah & Jonah. We just recently moved from Northern NH to Connecticut. I am definitely inspired to create CAS cards but every now and then I add a few layers but they are always CAS. This one is easy...My MISTI. I LOVE this tool. I find myself pulling it out to use all the time. No, I would not still buy it now because I have fallen in love with clear stamps and these were rubber stamps. I'm with you on the rubber stamps lady. I still have a few but I'd take clear any day of the week and twice on Sunday. Also, ironically enough people tell me I look like Sarah Jessica Parker. weird right? 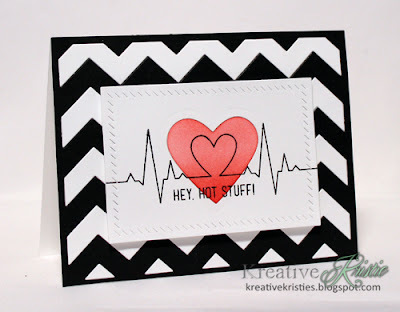 That bold chevron with the ink blended heart is fantastic. I love the little detail of the stitching on the die cut plus the dimension is just perfect for such a CAS design. White sentiment embossed on black. Girl, you know the way to my heart! I love the bright pop of those diamonds against all that gorgeous white!! Um what now? That sky! That sky is just stunning. I think building a scene inside her tree die is simply brilliant. So much dimension but with all that white space intact. Genius indeed! Before I actually show you the CASE I'm going to tell you, you're going to be confused. It's okay. It's not you, it's me. Que Simple Minds "Don't You Forget About Me" Oh wait, we're not breaking up. Give me back my diamond earring. First, I LOVED the idea of building a scene inside a frame. That's where I started. I decided to use the layout from the first card just vertical instead of horizontal. I love Kristie's use of black and white so I picked that up in my checkered floor. Of course there's a ton of bright colors because she loves 'em, I love 'em, and you should love 'em too! Initially I intended to make my banner black with white heat embossing like the second card but it looked ugh. So I didn't. Sometimes it just doesn't work out. All the stamps and dies are WPlus9. I started by stamping and masking several cupcakes and stands from Sweets & Treats. The large stand I even flipped upside down to get a different look. I drew in the floor and started my coloring there. Everything was colored with copics. I used a multiliner to outline everything once it was colored. My white gel pen and a few colored Souffle pens were used to add some fun dots and sprinkles. Of course I had to add a bit of Wink of Stella for some shine! I used the largest die from Rounded Rectangles to cut my frame and I added that with foam adhesive. I have the stamp and die for Basic Banners but I didn't want the white edge so I just fussy cut it. A bit of shading gives it some dimension. I know it doesn't look a thing like Kristie's cards but I like it anyway. Funny how things inspire us isn't it? I do hope you'll go see more of Kristie and her blog because she really is wonderful. EEEK! LOVE your CASE, Kelly!!! So beautiful and colorful!! Thank you SO much for the kind words and for featuring me here! You ROCK!!! Kristie's CAS cards are always a breath of fresh air! I love how she can do magic and keep white space intact. :) And I LOVE your CASE-d cards! Love how the banner turned out too!!! Love Kristie's style and such a wonderful case! I love it!! it's Gorgeous! Love your card Kelly...it may not look lie Kristie's but it's all about inspiration! I am a huge fan of hers as well! Have an awesome day! Oh Kelly!! I LOVE your CASE. It is so colorful and so YOU!! I love to see what inspires people too. It is so fun! I am love Kristie's blog too. She is amazing!! I am a big fan of Kristies style and she is a wonderful kind lady! Now I have another talented blog to peruse...there are so many ideas....thanks Kelly! Yep, I'm a KRISTIE fan too. Your CASe of spot on Kelly! So fun to read about Kristie - she is fabulous. Stunning card you made - your coloring skills are really superb! I love color but it scares me to death, Kelly! You and Kristie have definitely got it DOWN! 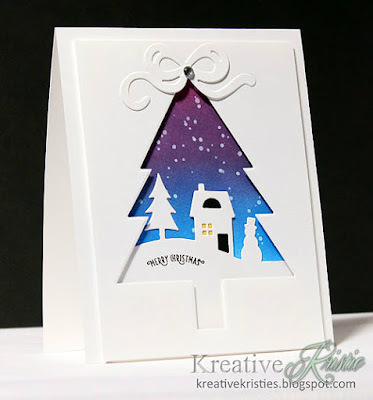 Lovely CASE and combination of Kristie's wonderful cards. Thank you for featuring Kristie... she is one-in-a-million kind, sweet - and she's my kind of girl who loves a good gab on the phone - right Kristie? Absolutely beautiful Kelly! I'm always gaga over your cards and Kristie's too!!! Already a follower of Kristie as I love her style. Love your unique style too, thats why I keep coming back. This card is so full of interest, so much to check out and admire. So fun getting to know Kristie better and gorgeous cards! Loved learning more about Kristi, and I think that your CASE of her work is absolutely brilliant and inspired. It takes true talent to take inspiration in an completely different direction, rather than replicating the original (which is what I always do). So fun to come by your blog and see how you are CASing many of my crafty crushes. It was so good to learn a bit more about Kristie - and to see how she inspired you to create something so totally different. Hmmm ... how does one get on your Birthday card list? ;-) This card is amazing, Kelly! Wow, hey there, Kristie, so nice to meet you!! You have a wonderful style in your cards and you just gave the all such a touch of class! Thanks for introducing her to us and Kelly, your CASE could not possibly be anymore spectacular and yummy than it is - truly magnificent in all its gorgeously colored glory!!! You have floored me and I think I should just stay down here cuz I am POSITIVE that it is going to happen again. Rock on, girl! !